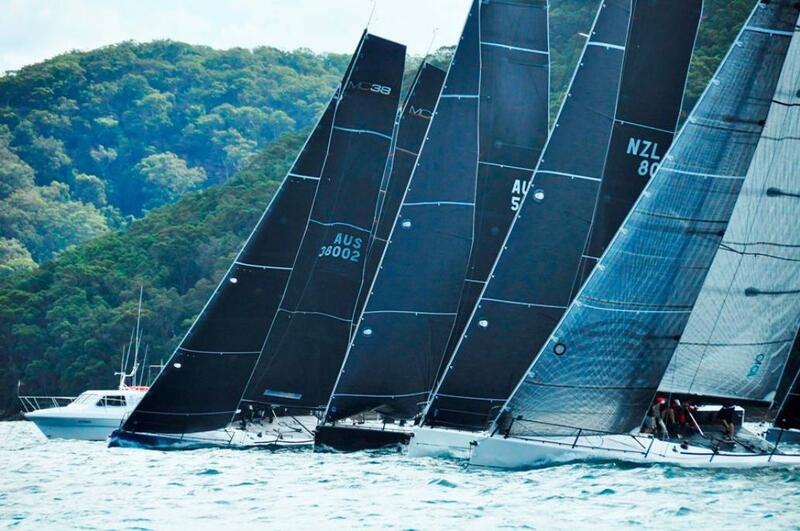 The MC38 class is straight back to work after the Christmas break with their Australian title planned for the long weekend of February 5-7, 2016 on shifty Pittwater, an hour north of Sydney’s CBD. Royal Prince Alfred Yacht Club will host the three day inshore series and class President John Bacon expects at least seven of the high performance one designs to compete, including Howard Spencer’s Auckland based Menace, the 2016 season point-scoring champion, and Leslie Green’s Ginger, aiming for a trifecta of national title trophies. In 2014 Ginger reigned at the class’ major title at Audi Hamilton Island Race Week and last year they won out against the tough one design fleet, beating Marcus Blackmore’s Hooligan and Bacon’s Dark Star. In 2016 the Menace that’s been absent from the last three Australian Championships is fronting, and the tough-talk has begun. Bacon’s coming to this year’s competition brandishing some new hardware. His brains trust has worked with one of North Sails top designers to develop a new mainsail, within the strict one design class rules, that is geared to making them a couple of boat lengths faster to windward. Coming off last year’s inaugural MC38 Australian Season Championship there was a strong push from owners to make the annual series span summer rather than the whole year. The 2016 series will be a three round pointscore following the nationals and Middle Harbour Yacht Club’s Sydney Harbour Regatta, on March 5-6. The 2016-17 season will begin in the second half of the year and continue through summer into 2017. Discussions are ongoing between the class and Hamilton Island for the fleet to make an appearance at Audi Race Week in August. RPAYC has offered MC38 crews wanting to hone their skills coming into the national showdown a series of lead-in events starting on Tuesday February 2 with a separate start for three short inshore races. On Wednesday February 3 MC38 crews are invited to compete in the afternoon Pittwater race commencing at 1400hrs and on Thursday the class will conduct a full race training session from 1600-1800hrs. Following training all MC38s are welcome to stay out on the water and compete in division 1 of the Thursday evening twilight race, commencing at 1805hrs. The 2016 MC38 Australian Championship begins on Friday February 5 for three days offering northern Scotland Island and Clareville waterfront residents, plus those out boating on the weekend a unique viewing opportunity. Harken has thrown its support behind the class once again, as sponsor of the final presentation BBQ on the Sunday afternoon.